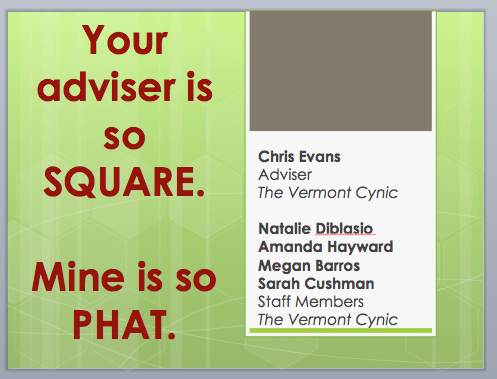 Your adviser is so SQUARE. Mine is so PHAT. This week we’re in Nashville for the annual convention of College Newspaper Business and Advertising Managers, or CNBAM. Yesterday I had the privilege of presenting a session called “Your adviser is so square. Mine is so phat.” with my students from The Vermont Cynic: Natalie Diblasio, Amanda Hayward, Megan Barros and Sarah Cushman. In our session, we sought to ferret out some of the less-obvious generational differences that can prevent students and advisers from reaching their combined potential. You can find a PDF of the presentation here. Enjoy.